In the 1990s a nationwide crime wave overtook Cote d'Ivoire. The Ivoirian police failed to control the situation, so a group of poor, politically marginalized, and mostly Muslim men took on the role of the people's protectors as part of a movement they called Benkadi. These men were dozos - hunters skilled in ritual sacrifice - and they applied their hunting and occult expertise, along with the ethical principles implicit in both forms of knowledge, to the tracking and capturing of thieves. Meanwhile, as Benkadi emerged, so too did the ethnic, regional, and religious divisions that would culminate in Cote d'Ivoire's 2002-07 rebellion. 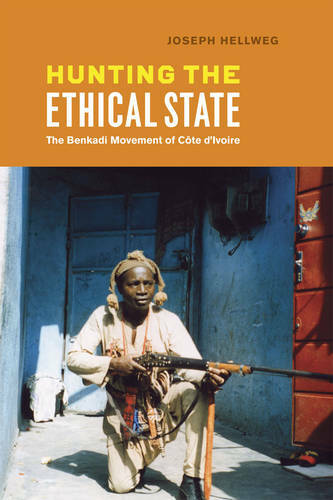 "Hunting the Ethical State" reveals how dozos worked beyond these divisions to derive their new roles as enforcers of security from their ritual hunting ethos. Much as they used sorcery to shape-shift and outwit game, they now transformed into unofficial police, and their ritual networks became police bureaucracies. Though these Muslim and northern-descended men would later resist the state, Joseph Hellweg demonstrates how they briefly succeeded at making a place for themselves within it. Ultimately, Hellweg interprets Benkadi as a flawed but ingenious and thoroughly modern attempt by non-state actors to reform an African state.